Sometimes, when you’re in class for 10 hours on a Thursday you need a quick, filling snack that satisfies your chocolate cravings.. well thanks to My New Roots that snack exists! 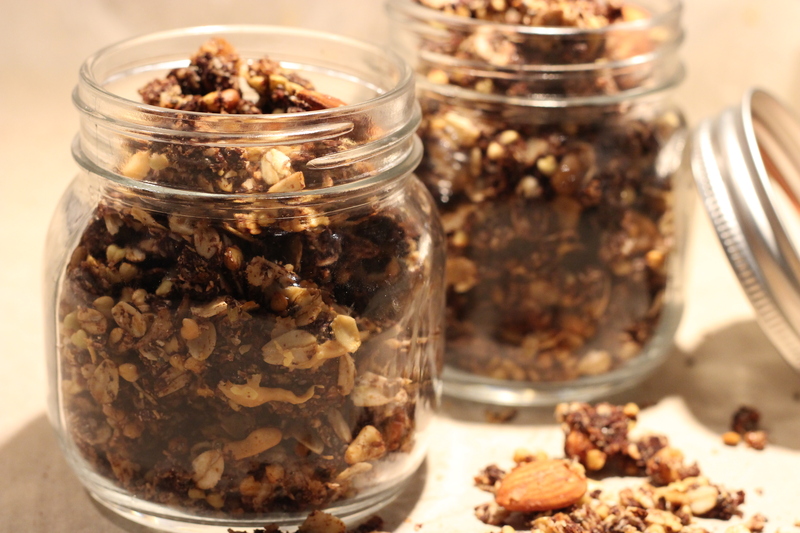 This chocolate buckwheat granola is perfect for mixing with some nuts and seeds for a quick sweet treat! I also top my overnight oats with this in the morning for some added sweetness and crunch! Buckwheat, despite the name is actually not related to wheat. It is a gluten-free seed that is high in protein and fiber, and is a perfect substitute for oatmeal when you want a little added protein boost! You can cook it just like oats to make a porridge-like breakfast or you can roast it, leaving it hard like in this recipe! Similar to oats, buckwheat can help lower blood pressure and cholesterol and also aids in digestion due to its fiber content. It may also keep you full for longer as it is higher in protein than comparable grains – which is why I chose this granola over typical oat-based ones! Buckwheat also contains polphenolic antioxidants which help protect against free radical damage, preventing inflammation. In this recipe we also get the antioxidant benefits of cocoa powder and the gelatinous binding benefits of chia seeds! 2. In a bowl combine oats, buckwheat, coconut flakes, chia seeds, coconut sugar and nuts. 3. In a pot, melt coconut oil over medium heat. Add honey/maple syrup/brown rice syrup, vanilla, salt and cocoa powder. Whisk until smooth. 4. Pour liquid ingredients into dry, and fold in until fully coated. 5. Spread mixture on a lined baking sheet and press firmly with the back of a spatula to ensure the mixture is compact – this makes the clusters so make sure its pressed well! 6. Bake for 15-20 minutes. Remove from oven, flip in large chunks and bake for another 10 minutes. 7. Test a hazelnut to make sure it is fully roasted for the best flavor. 8. Let it cool, store it in jars on the counter – mason jars work well! – If the mixture is not chunky enough after the first 15-20 minutes, drizzle more maple syrup/honey/brown rice syrup and press it in before baking for the second half.